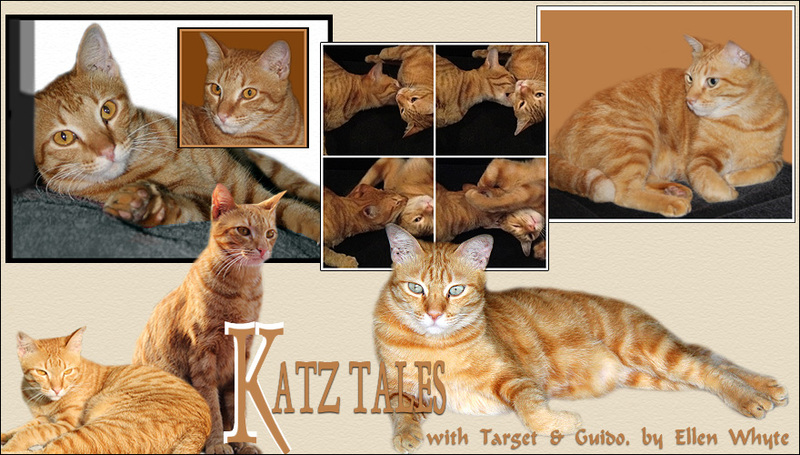 Katz And Other Tales: Guido: I Am Sent A Present! And Target Steals It!!! Guido: I Am Sent A Present! And Target Steals It!!! Our friend Bin sent me a Present! It's from her Silvervine Shop! But when Target saw the package, he wanted it. Get off! This is clearly for me! Now, how do I open this? Bin sent me a silvervine pillow and some chew sticks! It all smelled Very Good. He took the pillow, even though it was meant for Me. But I finally got a go too. Thanks Bin! Tomorrow I get a chew stick! It's going to be a good Saturday. Oh my!!! I want one too!! Make that seven. We are not good at sharing around here. purrr....meow! your friend is so nice, these are wonderful gifts!It's so nice to have a surprise like that! Lucky friends! ahhh and I love these pictures! OMC! I've got to get my hands on some of that silvervine stuff! LOL! It's great stuff, isn't it? We got a package from Bin earlier this week too. The pillow has gone over very well, but the leaf--not as much, surprisingly. Goodness that sure is a terrific way to start the weekend!!! Looks like lots of fun! Have a great weekend. Sounds like lots of fun... even if you do have to share. It looks like a great gift! Enjoy! Presents are fun! Sometimes sharing is overrated! those are some wonderful prezzies! Enjoy! Oh we ordered some silvervine pillows too! We can't wait to get them!! If mes gots my paws on some of that silvervine, me would not share at all! The silvervine pillow looks like great fun. We are so pleased you love your pillow - Mum has just got us another in reserve!! Ha ha ha, Target, you are so funny :-) The pillow looks a lot of fun. Glad you both got to enjoy it! Have fun and have a wonderful weekend!! They look like they're having a lot of fun with the package! Very nice gifts! Looks like it was a fun weekend at your house. Can Cheops come over and play? He promises not to take your toy. Apparently this "silvervine" has a lot of success ! I don't know it all. I bought a spray with catnip odor and sprayed all of Rosie's toys, result : nothing ! No cat moved ! Those pillows from Bin are just the greatest. We got on a while back and we have worn it out. Glad to see you two working it out and taking turns with the pillow. Have a great week. what a lovely gift. your friend is so kind. I just accidently stepped on my cat's tail. A present or a treat might be in order. It was so rude of me! Great present! Enjoy -- and hang on to it tight so no one else gets it! thank you for stopping by and adding support for the anti-word verification post! appreciate it!! Hey Target! Don't Bogart that 'nip! you looks like yer haffin' a lotta fun!! our mommer gotted us some silvervine powder an' sprinkled it 'round--we went coo-coo fur a while. that's some great stuff! These photos are solid gold! I like it that Target goes all silly over the pillow! Silly is Good!